Although most batteries used in uninterruptable power supply (UPS) and battery back-up systems are touted as "maintenance free," they are still susceptible to deterioration from corrosion, internal shorts, sulphation, dry-out and seal failure. But how do you determine when or if your battery is going to fail? Many people think monitoring voltage, either through online voltage monitoring equipment or in-person voltage tests, is enough. 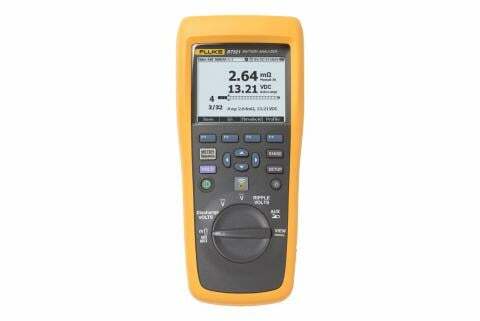 But measuring voltage alone won’t give you a complete picture. Voltage is simply an indication of a battery’s state-of-charge, rather than a battery’s state-of-health. Voltage won’t signal a battery’s degradation until late in the battery’s life which increases the chances for the entire battery string going offline in the event of a failure. Even when a battery has the correct voltage measurement it can still fail when a load is applied. So what approach should you take to determine a battery’s state-of-health? One of the best ways to measure a battery’s state-of-health is to measure battery impedance. By measuring impedance you can better understand the internal resistance of the battery, which provides a better picture of overall health. When measurements are taken over time, impedance values prove to be a useful trending tool signaling potential problems much earlier than voltage testing alone. 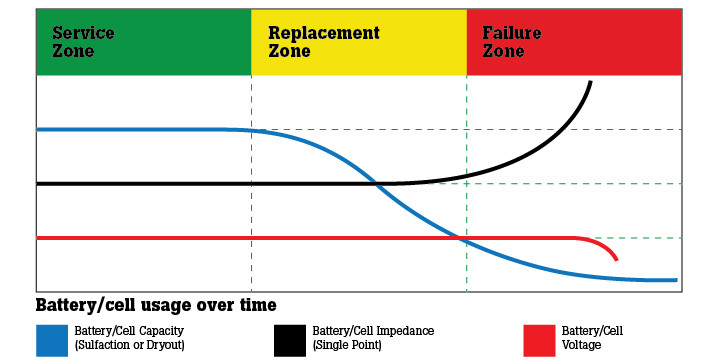 Over time, a battery’s internal resistance, or impedance, typically increases indicating degradation in the cell. The first time you test a battery’s impedance it can be worrisome because there is no baseline with which to compare data and draw conclusions. In those cases it is good idea to compare each cell against the other cells in the string. By doing this the weak cells will stand out and indicate that further investigation is likely required. It’s important to remember that a single impedance measurement is of little value without context. Best practice requires measuring impedance values over months and years, each time comparing them to previous values on record to create a base line.